How cute these last projects all are. The fabric combinations are super. Loral....Thanks for the nice comment! 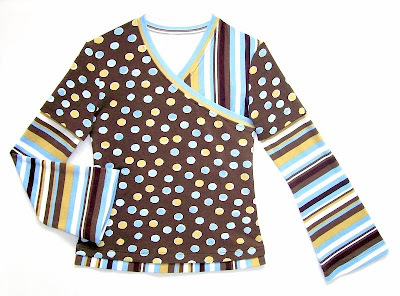 Since this is a fall/winter top, the sleeve is double (hemmed short sleeve place on top of striped long sleeve, and set-in as one). The hem is layered...a folded strip of fabric tucked under the hemmed shirt and topstitched to attach. This is one of my most favorite items you have made. The colors and style are fab-U-lous!! Another winner, I love this! So cute, Pam! Thanks for all the how-to details. You always come up with an elegant solution to unusual constructions. Oh I love that top! Your sewing is always so inspirational! Which issue of Ottobre does the original pattern come from? The issue is listed in the "Sewing Notes" at the bottom of the post....Ottobre Design, Issue 01/05. ...But always feel free to ask questions..happy to answer them!